Commissioned bronze relief entitled 'Relief of a Saluki' by Benvenuto Cellini (1500-1571). AKC Standard: " Long, supple and well-muscled." Amherst: Neck—Full and well-carried, long and supple, slightly arched over the windpipe. Pre-1971 FCI: Neck: Neck/shoulders should be long, flexible, elegant. The muscles should not be too evident. Comment: A neck ruff can give the appearance of a ewe neck (or cover one up), or cause the neck to appear shorter. We have a lot of ewe necks, short necks and thick necks and mostly, necks that don't flow into the withers. Amherst: The chest should be deep and not too narrow. Flat ribs. Pre-1971 FCI: The brisket is flat and very deep. The ribs are barely rounded and usually visible. Arab: Chest must be deep and strong. Comment: Placement of the forequarters in relation to the chest can affect the appearance of its size. The point of shoulders should be approximately even with the sternum. Viewed from the front, an inverted “V” should not be formed between the forelegs. Excessively deep chests are not necessary for endurance and in fact the chest should never reach beyond the elbow. Amherst: The shoulders set on obliquely. Pre-1971 FCI: Forequarters: Seen from the front fairly wide, the shoulders well sloped, long, strong, well-muscled and firmly laid to the body. Elbows closely set to the lower portion of the rib cage. Arab: Elbows should be difficult to press together. Comment: Although salukis should NOT be as angulated in the forequarters as trotting breeds, some angulation is necessary. Many dogs with sloping shoulders have straight upper arms, and many dogs with upper arms set under them have upright shoulders—neither is correct. A decade ago our big problem was straight upper arms. We gradually improved that---and then went beyond improving it so now many of our top winners have upper arms that are set much too far under the body. When these dogs try to gallop they can't. A sporting dog front is as incorrect, actually more so, than a straight front. You will often see these fronts combined with prominent keels. They are eye-catching but not correct for a sighthound. 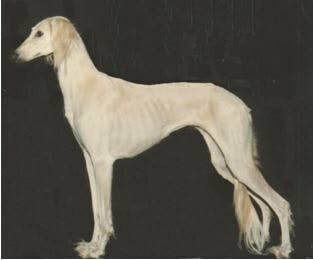 THE SALUKI SHOULD NEVER HAVE A PROW OR FORECHEST. The front of the chest should be approximately equal to the front of the upper arm. REMEMBER: IF IT WOULD LOOK GOOD ON A WEIMARANER IT IS NOT CORRECT FOR A SALUKI! Amherst: Forearm of a good length from shoulder to elbow, and short from knee to ground. Foreleg slightly feathered. Pre-1971 FCI: The foreleg is long, straight, and well-muscled. The pasterns are relatively short. Arab: Wrists should be small and point forward at a slight angle. Comment: Dogs that are short between the elbow and pasterns tend to be unbalanced and often lack speed. Slightly sloping pasterns are the most attractive. All pasterns bend such that both the foot and stop pad are in contact with the ground when the dog is at full gallop, no matter what their slope. The front feet of some dogs tend to turn outward; whether this is considered faulty or preferable is controversial. What IS faulty is toeing in, which is a severe fault for a sighthound. Feet: AKC Standard: Of moderate length, toes long and well arched, not splayed out, but at the same time not cat-footed; the whole being strong and supple and well feathered between the toes. Salukis should have large feet for their size. As in all dogs, the front feet are larger and slightly more round than the rear. They do not have the high arch that most other breeds have but at the same time they should not be flat. It is a longer, slightly flatter foot, with longer nails than you would find in most other breeds.